Today is Monday, so that means its Lollipop Crafts Challenge day! This week is Happy Holidays. So, I hope you can jump in and let’s see what you come up with and don’t forget our sponsor spotlight on Thursday too!! The Lollipop team will be taking a break from December 18th until January 8th in order to spend time with their families. The blog will return on January 9th with all new challenges for you! Our Wonderful Sponsor this week!! Great card, fab shape and that colour of seam binding is just lush! What a wonderfully unique shaped card. You've made a perfect Happy Holidays Card! Thank you so much for joining us at Make It Monday and The Squirrel & The Fox. Mal was anderes, gefällt mir aber,Danke fürs Mitmachen bei den Kreativen Stempelfreunden. Ooo gorgeous ribbon! Love the shape of the card too. Love the shape of your card. I saw it at Make it Monday! wow what a stunning xmas card!! thanks for joining us on CREATIVE STAMP FRIENDS!! 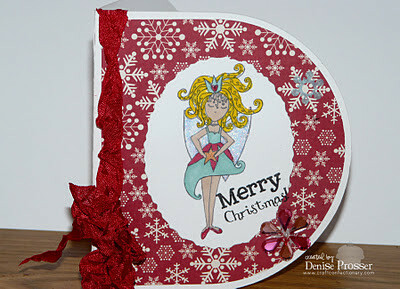 Cute card and lovely image Denise and love the shape too. Love the shape of your card and the image you've used.